State bank of india (SBI) has introduced Mobile Banking Application for its customers. 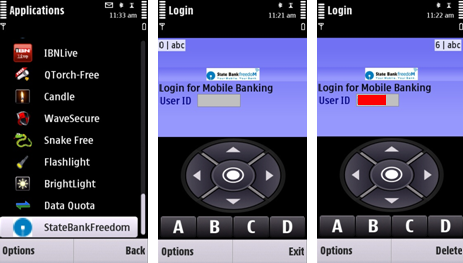 Learn how to register, install and activate SBI Mobile Banking Application - State Bank FreedoM. UPDATE: Now Android users can download Official Sbi Mobile Banking app - State Bank FreedoM- from Android Market or Google Play store here. 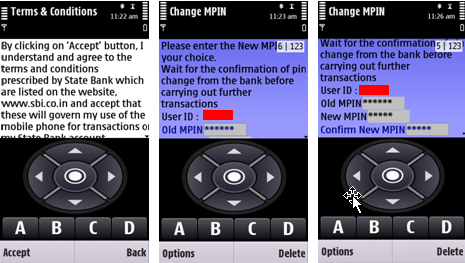 you will get a “User ID” and a “default MPIN” via SMS. 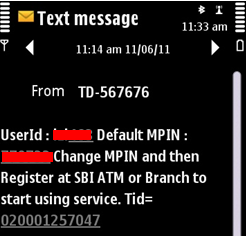 This User ID and MPIN are required while installing SBI Mobile Banking Application. Navigate to SBI Mobile Banking Application - State Bank FreedoM on your phone. Click on SBI FreedoM to install the application on your mobile phone. Once installed, go to installed applications on your cellphone and click on ”State Bank FreedoM” to open the SBI app. Enter User ID for State Bank Freedom login as obtained in your registration SMS. Use alphabet keys “A,B,C,D” as shown to enter User id annd MPIN. Press ‘D’ a few times to get input mode as “Nat” in the top right corner of SBI app. Then press key ‘A’ to go into native text input mode in your cellphone. Enter your SBI mobile banking User ID and MPIN. Press the button in the center of circular dial for OK.
Click “Accept” and you will be asked to enter your default MPIN as sent in your SBI Mobile Banking registration SMS. In next screen you will be asked to change your MPIN. 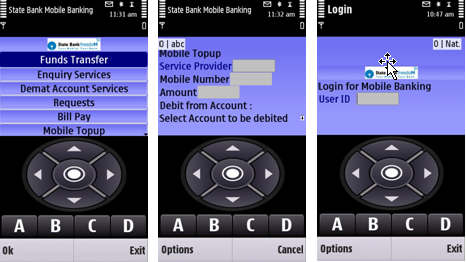 Now all State bank services will be listed and you can click on anyone on them to access mobile transaction services. Use your ATM debit card to access any State bank of India ATM machine (using your debit card pin code).When you see the menu on machine screen choose “Mobile Banking Registration”. and follow the instructions on next screen. You will have to enter your Mobile Banking PIN or MPIN. In a few steps your Mobile Banking Application will be configured and you can use it then for money transactions. Visit your nearest State bank of India branch and ask a bank executive to help you to activate your SBI Mobile Banking Application.